We regularly evaluate outside costs, labor and cycle times to offer competitive pricing for quality products. The telecom industry is one of growth, innovation and vision. Your source for plastic injection molded products should reflect those same attributes. At Bright Plastics we embrace the latest industry improvements in product design, material behavior, tooling, machinery, automation and manufacturing trends in general. We regularly evaluate outside costs, labor and cycle times to offer competitive pricing for quality products. 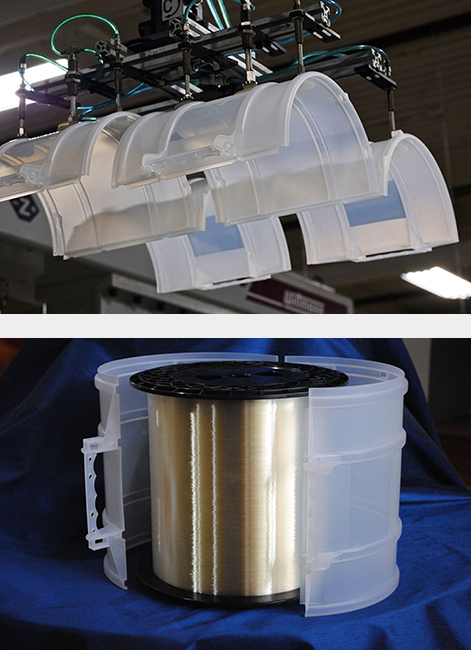 Products we manufacture for the telecom industry include fiber optic spool covers and carrying cases. Our forte is custom injection molding. Our versatility has earned respect in the industry and kudos from our customers. We adapt to your project parameters. We’d like to hear about your business, your concerns and the types of products you may have pending. Need a fresh approach to design or production? Please call 336-668-3636 or email sales@brightplastics.com.